Afternoon Loverlies! 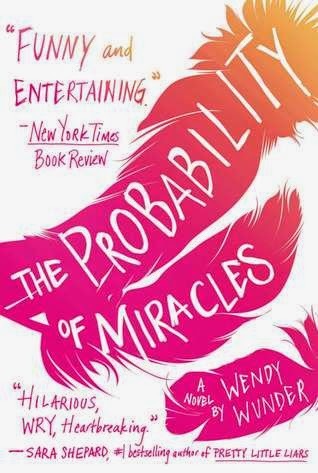 This week I have read The Probability Of Miracles by Wendy Wunder. I thought this book was well written and it was very hard to put down. I disliked how the main character did not believe in God, but really that is life, Not everyone believes in God. It made me sad though, I kept hoping for the character to find God in something. Campbell is the main character in this story, and it is very sad she is dealing with cancer. She has had a lot of loss and hurt in her life. That including cancer, will easily tear down a person's faith, body, and mind. She is kind of an introvert because of it, but she does have one friend a few states away named Lily, whom also has cancer. They met at a summer camp for cancer kids. While at camp they decided to make a flamingo list, which is a list of things to do before they pass away. Campbell's list is a bit wilder than lily's, but it was interesting how she was able to complete it. Even though this story is filled with a bit of sadness, there is also adventure and love. Wunder did a great job writing this story to where I felt very connected to Campbell. I felt for her and was rooting for her to get better. I really did enjoy reading this book, and I think y'all should give it at least one chance. Campbell Cooper has never been in love. And if the doctors are right, she'll never have the chance. So when she's told she needs a miracle, her family moves 1,500 miles north to Promise, Maine--a place where amazing, unexplainable events are said to occur--like it or not. And when a mysterious envelope arrives, containing a list of things for Cam to do before she dies, she finally learns to believe--in love, in herself, and maybe even in miracles, as improbable as they may seem.